We already know that robots are destined to steal all our jobs. 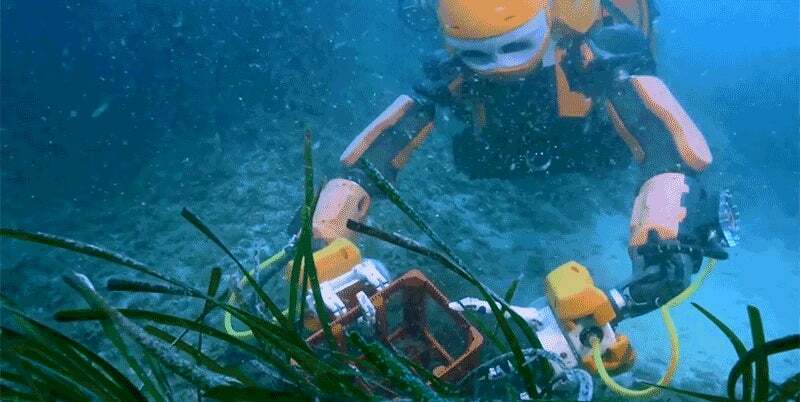 But thanks to some foolhardy researchers at Stanford University who have developed an articulated robot that can dive and explore underwater shipwrecks, our android rivals will soon be stealing all our pirate treasure too. For the time being, at least, OceanOne is completely dependent on a human operator who's able to monitor what the robot is seeing through a set of cameras. It does have some basic level of artificial intelligence and autonomy, but to ensure the OceanOne's arms aren't going to damage delicate corals or the disintegrating hull of a ship, the operator is able to precisely control them using haptic feedback allowing them to feel what the robot does. Oceanographic researchers have been using remotely operated rovers for decades now, but their underwater abilities are often severely limited to just a crude robotic arm and pincer for grabbing objects. OceanOne appears to be almost as capable as DARPA's ATLAS robot, but tailor-made to easily manoeuvre underwater. Its compact size also means it can squeeze into parts of a shipwreck that are too deep for human divers and too small for a submarine. We probably shouldn't expect it to willingly share any gold doubloons it finds, though.